Spacious 18 month old 4 bedroom, home complete with fencing and landscaping. Close to all amenities including proposed new school & shopping centre. - Entertainers kitchen complete with a dream 900 mm freestanding stainless steel oven with gas cook top for the home chef. -Large double door pantry, Stainless steel dishwasher to make clean up after meal times seamless. 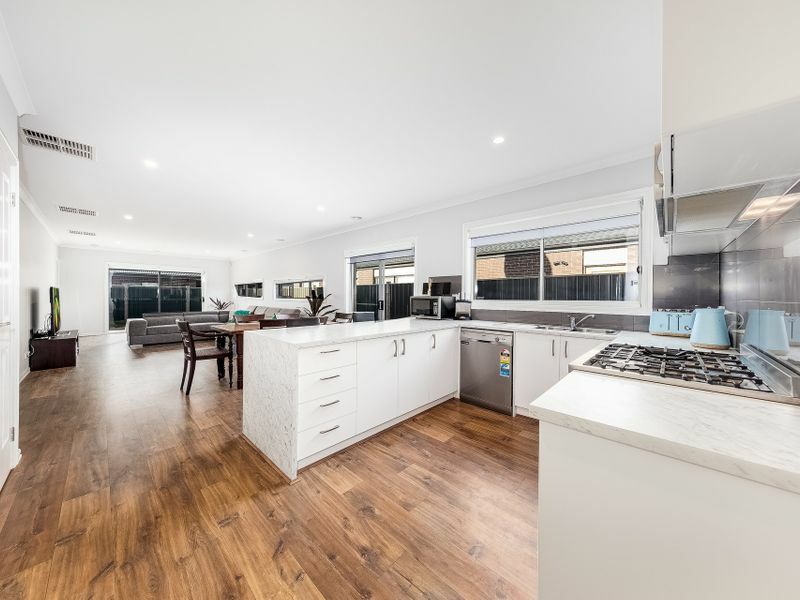 Enjoy a cuppa at the Breakfast bar in laminated marble effect bench tops or dine in the spacious meals/ family area that leads out to a polished sunny back deck for your pleasure. Double bricked garage with remote lift doors opens fully to the backyard for easy access and undercover parties. Ducted Vacuum points system, - Solar Rinnai hot water service, Security system just keep adding to the value of this home. All 4 large bedrooms have built in robes. The master bedroom boasts double sinks and seamless glass shower in the ensuite and a great walk in robe with plenty of storage space. Large separate laundry with external access and colorbond storage workshop in the back yard. Nearby is Barton Primary School, St Peters College, Amstel Golf club, Royal Botanic Gardens, walking distance to bus stop, only 5 minutes drive to Cranbourne Train station and easy access to the freeway and only 15min drive away from the gates of the beautiful Mornington Peninsula. PS: Kindly bring your photo ID on all the open houses and you can contact the agent to arrange a private inspection for you at a convenient time.